Own this one of a kind wearable art piece by Vincent Gallo. 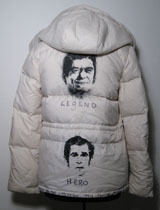 Helmut Lang hooded parka transformed into Vincent Gallo's political "Campaign Trail" piece. Featuring Ronald Reagan portrait titled Legend, and George Bush titled Hero. Bottom hem reads "Vincent Gallo on the campaign trail fighting for the good of everyone." Front reads "USA". Authentic Helmut Lang and Vincent Gallo labels. Signed and dated 2004. Previously owned by Vincent Gallo, has some signs of wear.